Grabbagreen’s menu wall can be somewhat intimidating because it is so chock full of options. I recommend perusing the website before you go in. It is beautifully laid out and clearly explains all your options. It outlines which ingredients are organic and highlights health benefits of each. Hours: Monday – Friday; 7 a.m. – 7:30 p.m., Saturday and Sunday. 9 a.m. – 6:30 p.m.
Ambiance: The bright green walls and flood of sunlight are trademarks to this healthy eatery. Food is served in boxes and silverware is plastic, but what this fast casual lacks in elegance, it makes up for in quality. The Franklin location has barstool seating lining the floor-to-ceiling windows and also offers a small patio that is wonderful on a warm day. The staff is always friendly, knowledgeable and great at explaining the details Grabbagreen bases its business on: Organic food sourced locally whenever possible. What to eat: Grabbagreen’s menu wall can be somewhat intimidating because it is so chock full of options. I recommend perusing the website before you go in. It is beautifully laid out and clearly explains all your options. It outlines which ingredients are organic and highlights health benefits of each. Did you know blackberries fight cancer? The menu basically consists of salad- or grain-based meal, fresh pressed juices, smoothies, detox drinks or snacks. The Grabbagreen salads are delightfully different than any other salad in town. For example, the Gangnam City ($10) is made with spinach, kale, steak, brown rice, bean sprouts, edamame, cucumber and chia seeds with sesame dressing. Or the South Beach ($10) made with spinach, kale, beet, avocado, feta, blueberries, pistachios, hemp, parsley and Mediterranean pomegranate dressing. The Grabba Grain bowls are also a refreshing boost the usual lunch options. 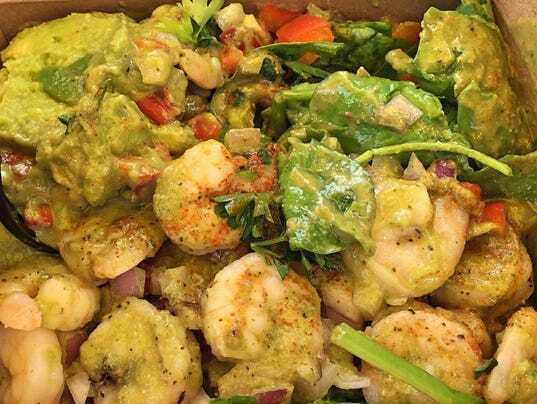 The French Quarter ($10) is brown rice, shrimp, red pepper, spinach, avocado, red onion, cayenne, parsley and creamy avocado dressing. My personal favorite is the Southwest ($10) with quinoa, chicken, corn, black beans, tomato, avocado, cheddar jack, cilantro, and the yogurt agave barbecue dressing, which you could eat all by itself it is so yummy. What to drink: This is another area where Grabbagreen doesn’t take the easy way out. There’s no 164-flavor Coke machine here where you can make cherry limeade root beer Sprite. Instead, there are all sorts of fresh fruits and naturally occurring substances pressed and blended and served in a near-natural state. We shared the Green pressed juice ($6), which is a simple, very green blend of cucumber, apple, kale and celery. There’s also Heal ($6) with melon, carrot, apple, tumeric and lemon, or Wellness ($6) with apple, carrot, lemon and strawberry. Like something a little thicker? How about a smoothie? They have something like 15 options including the Energizer Elevator ($7), which is espresso, banana, whey protein, flax, vanilla, almond milk, cacao and agave, or the Oxidation Elimination ($7) with acai, blueberries, blackberries, strawberries, banana, spinach and agave. Grabbagreen also offers kids meals that are cleverly healthy in disguise such as the Power Pail ($5), which has chicken, one green, one veggie and one sauce or the Green Monster Smoothie ($5), made with mango, pineapple, spinach, orange juice and honey.